If you are not completely satisfied with your initial order of 1, 2, or 3 bottles, within 90 days, we'll refund the product price, regardless of the reason for the request. 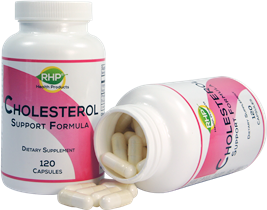 Yes, I want to order the RHP® Cholesterol Support Formula at the sale price of $26.70 per bottle (a 30 day supply) - discounted from $32.70 which is an 18 percent discount! required to process your order. before entering further address information. Please select your country before entering further address information. *Have you ordered from us before? Want to Buy Several Different Products? Use Our Shopping Cart and Save on Shipping! 1. Figure out your order total including shipping by clicking here. All orders are processed and shipped using First Class Mail on the next business day from date received. If you have any questions about the information on this site or would like more information about our products please do not hesitate to call or email. Order Your RHP® Cholesterol Support Formula Today! Our Product Consultants are standing by to help you! Real Health Products logo is a trademark owned by Real Health Products, Inc.
WSN® is a registered trademark owned by Wellness Support Network, Inc. and is used with its permission.